Sequels get a bad reputation; they usually use the same old formula from the first version, relying on people’s fond memories to bring them back for more. Just take a look at the Hangover series, the first sequel was beat for beat the first film, Cars 2 didn’t capture the magic of the first and the Bridget Jones sequel just didn’t give us the feels that the first one did, right guys!? There are exceptions, not many, but a few; there are the Die Hard movies (the ultimate Christmas films), Home Alone 2, and our re-Imagined Christmas cocktail of the month… Slushy sprouts & blended turkey!!!! As any of you that joined us last year may know, last year we discovered the classiest way of serving the ultimate cocktail was in a booty, fact! (Not fact checked). So this year, we wanted to iterate on last year’s Christmas cocktail by taking our little booty and transforming it into something better, something that Santa himself would treat himself to after a long shift at work. 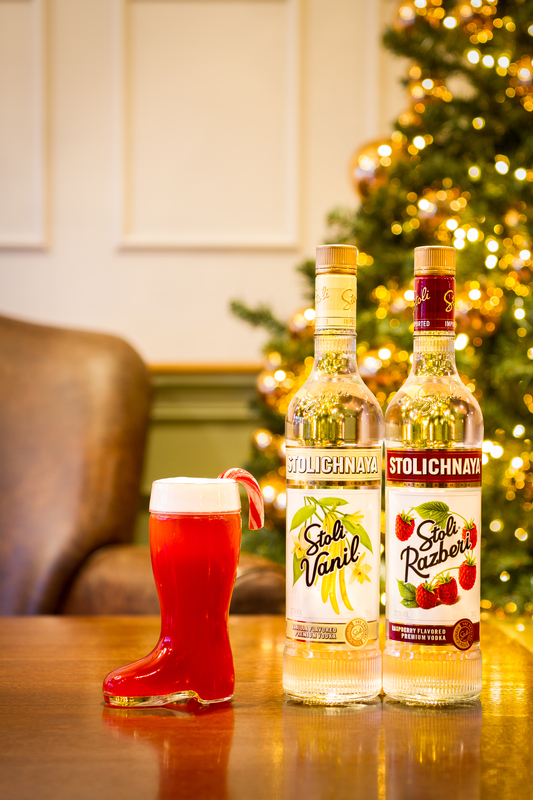 We ran with the idea of keeping the boot and focused on the taste, we brought back our favourite flavoured vodkas, Stolichnaya Razberi and Vanil, and mixed them with fresh strawberry coulis, lemon juice and cranberry. All topped off with a pineapple foam. Rebooted is a fruity gift that’s worthy of the original and wrapped up in one of Santa’s own boots. (Not actually his boot). We have also added a candy cane garnish, which looks good and tastes better, because at Christmas, whether you’re naughty or nice, everyone deserves a treat. This month, when you’re in town getting the Christmas shopping done, remember, doing it online is easier. However if you need a break, or feel it’s time to celebrate, come and join us at the Dial for a Stoli good time.